This “high touch” solution will take care of virtually everything you need to get up and running with your own branded VR Arcade quickly. You need to make sure participants can play safely. The booths don’t interfere with each other. VR is almost as fun to watch & film as it is to play! The next phase is all about the Hardware. It’s no secret that we use the HTC Vive so your customers can enjoy the best VR experiences on the planet. But the VR Headsets is only one part of the hardware equation. You need high end gaming computers. We start by Procuring those. We’ll take care of the selections, ordering and the initial Configuration. This means we install all of the software and drivers you’ll need to run VR and get your computers ready to go. We have an entire page dedicated to what our proprietary VR Arcade Management Software does, so you can check that out at your leisure. In short, it is designed automate many of the processes inside of your arcade so you don’t have to be. One very important aspect is how it manages the Licensing fees every month so your arcade remains compliant. You’ll always know which games are hot and which games are not. Here is where we really shine…the Installation phase. We will ship all of the computers to your location and get them paired up with monitors and the VR headgear. While we don’t handle the physical build out of the space, we do handle just about everything else. We will make sure that each booth is setup and optimized for the best play experience. This includes setting up all of the equipment while making sure that the sensors are placed in a manner that eliminates interference. Part of what makes our installation so excellent is that we spend a portion of that time Training you and your staff on how to operate your new VR Arcade. We provide you information that will help you excel at Customer Experience. This starts with helping customers get into the goggles and explaining game play and goes all the way through best practices for Marketing and Operations. Once your facility is setup and tested we go through one more phase and help you with Game Selection. Our Software runs in dozens of VR Arcades around the planet and we have collected vast amounts of data on which games do best. We’ll take the time to understand (or help you define) your ideal client and we’ll make sure you have the right games available for them. This is important because if you give customers too many choices, they spend a lot of their time just figuring out what they want to play. Neither you or they want to pay for that time. Getting your facility setup and operational is really just the beginning of our relationship. As a client of Private Label VR you will be invited into our exclusive PLVR Club. There you will find access to all of the information, products and support you need to grow your brand new business. If you’re interested in learning how we can get you all setup with your own branded VR Arcade, contact us. 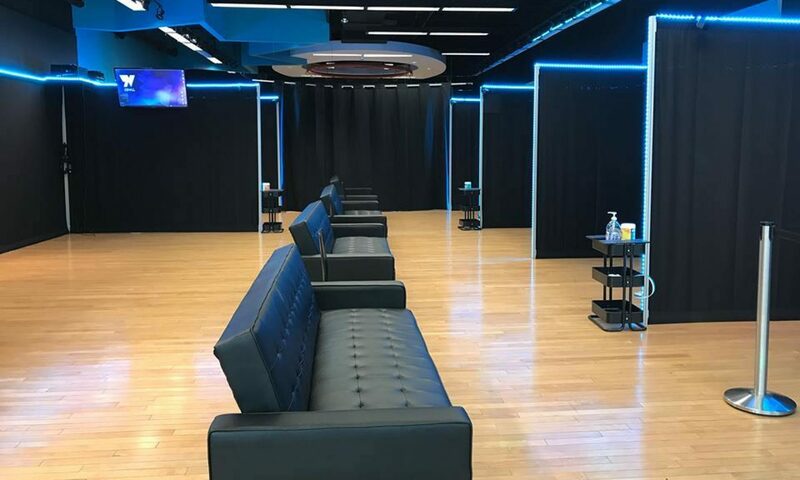 We believe bowling alleys are the perfect nationwide (worldwide really) infrastructure to be able to efficiently bring Virtual Reality Arcades to the masses. Think about how many towns/cities have bowling. It’s always a good time to work with “purveyors of fun”. We will have the coolest shirts and posters in the joint! We asked our buddy Dave Cavnar to put together a cool bowling scene for us and that he did. Wanna see something even cooler? Check out the video of this art. You can really see just how detailed and how totally immersive it is. The only way to see it clearer is to be looking at it in TiltBrush where it was created. And if you’re at the Bowl Expo with us, you certainly can. Here’s your invite to come check us out at booth 916.